It is not unusual for people to have a body odor. For some they feel this odor is beyond what they would expect from missing a shower or two. They struggle to make me understand the depth of their concern. hese patients are often concerned that they are offensive to those around them. Some have expressed that they see others recoil when they speak. For many patients such responses by people around them may result in self-imposed social isolation, emotional pain, and the trying of numerous remedies for the problem. Some of these remedies may be harmful to the person. It is normal though if your breath is a little “funky” in the morning. This is especially so if you sleep with your mouth open and do not brush away food debris before going to bed. Here, an open mouth results in a dry mouth that is a haven for bacteria. The normal bacteria that live in our mouths can then make chemicals that contain sulfur. This sulfur is especially offensive to the nose. Dr. Madeline S. Deming from NIH, (National Institutes of Health), says that bad breath is most often caused by bacteria on the teeth and tongue. It can smell like rotten eggs or onions. Usually brushing the teeth, the tongue and a little mouthwash takes care of the problem. When it does not then make sure the bacteria has not caused tooth decay or gum disease. Both can result in pretty bad odors and will require you to see a dentist to take care of the problem. Certainly sinus problems, infections in the throat or lungs can result in foul breath. A trip to your healthcare professional may alleviate this problem. Because your breath can carry gases from other parts of your body, this can be a sign of medical problems. Fruity breath or when the mouth smells like rotten apples may be a sign of uncontrolled diabetes. In rare cases, breath that smells like ammonia or urine may accompany someone with kidney failure. In some rare cases of liver failure, a person’s breath may smell musty or resemble garlic and rotten eggs. When people are stressed, they may produce a foul odor in the sweat of their armpits. It is no secret that bacteria hang out armpit sweat. Hair in this area allows bacteria to grow and multiply. A little soap and water with some shaving in a few cases, plus a good deodorant can often take care of the problem. Odors that the body produces can often tell a story of illness. 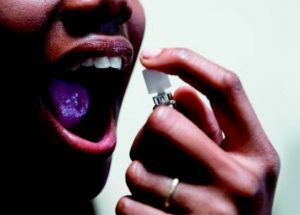 NIH is working on electronic “noses” that will be able to “smell” you and help with the diagnosis of certain diseases. Scientists have already trained dogs with their superior sense of smell to detect certain cancers by smelling a research subject’s breath. Dr. Deming suggests that if normal brushing and mouthwash fails to eradicate one’s bad breath, visiting a dentist is the first line of defense. She also suggests avoiding onions, garlic and other strong smelling foods. If the odor persists after proper care, a trip to a medical healthcare provider may be necessary for further testing.